JIMS Rohini Sec 5 organized the Corporate Panel Discussion for MCA programme on 17/02/2018 (Saturday). 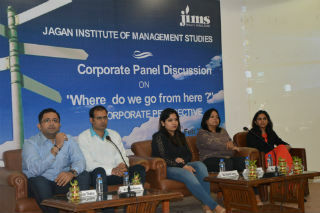 Alumni from the corporates were invited for the interaction with the students. 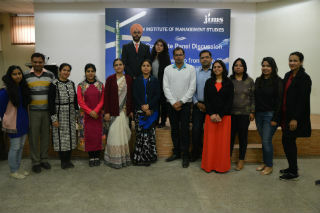 The speakers were Mr Garima Vashishtha and Mr.Karan Thakur from NCR Corporation, Ms.Vani Verma from Cadence Design Systems , Mr.Ritesh Papeneja from EValueServe and Ms.Suman Vohra from NEC technologies. The session started at 11AM and ended at 1 PM. 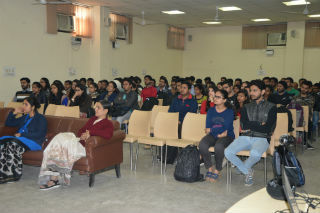 They discussed about the different profiles in the IT industry such as UI designers, Technical Writers, Software Tester etc..
Ms.Garima discussed about the Cloud Computing concepts, SQL Injection and Ethical Hacking. Mr. Karan explained the importance of analytic skills and logical thinking for the success in the technical interview. Ms. Vani Verma motivated the students for technical writing and discussed the importance of technical documents in the IT industry.Mr. Ritesh guided the students for various phases of software development cycle. Ms.Suman explained the need of software testing and various profiles in the testing domain for the freshers. The session was an interactive session and panelists motivated the students for asking the questions related to their doubts. 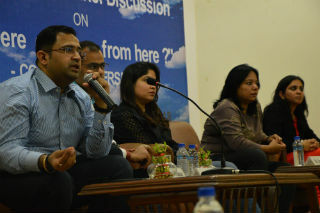 Panelists were guiding the students for their placement preparation.